Abstracts must be submitted by May 27, 2013, to e-mail address abstracts.frs2013@ursi.fi. The abstract must be added to the e-mail message as a PDF file attachment and named as required by guidelines. 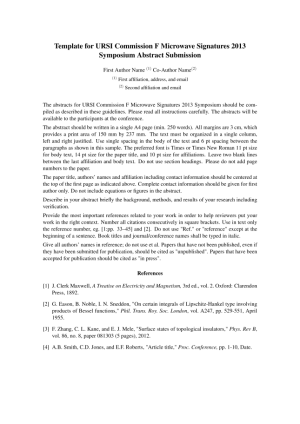 The body of the message should contain full contact information of the corresponding author. Notification of the review outcome is sent to every author by July 15, 2013. The abstracs should be prepared using the provided templates. The length is one page. All abstracts must be sent in PDF format. The maximum number of abstracts per author is three. Students paying the reduced participation fee are allowed for one presentation. Review outcome notifications will be sent via email. Authors of accepted abstracts may request an official acceptance/invitation letter. Please name the abstract file according to corresponding author name and add a numer if you submit more than one abstract followed by suggested Topic Area codes in order of preference. For example "John_Smith_1_S1_S2.pdf"
If you prefer a poster presentation, please indicate it in the e-mail. When submitting your abstract, please indicate your preferred topic area (first choice and second choice).accordance with the table below.